Hello and happy Monday dear readers! This is with some March-inspired ideas for your coffee table, Easter gathering or any upcoming celebration with family and friends. This year still seems so very young to me – but Easter holidays are already in sight. Easter is a big deal in Germany and aside from its traditional meaning, it also makes us feel excited because when Easter comes we know that SPRING is in sight, which is so exciting, isn't it? Easter lends a pretty good reason to set a Spring-like table in tender colors. And speaking of color, did you read that rose quartz is one of the two for 2016? Their website said something rather interesting about their reasoning behind their pastel color choices, "As consumers seek mindfulness and well-being as an antidote to modern day stresses, welcoming colors that psychologically fulfill our yearning for reassurance and security are becoming more prominent." 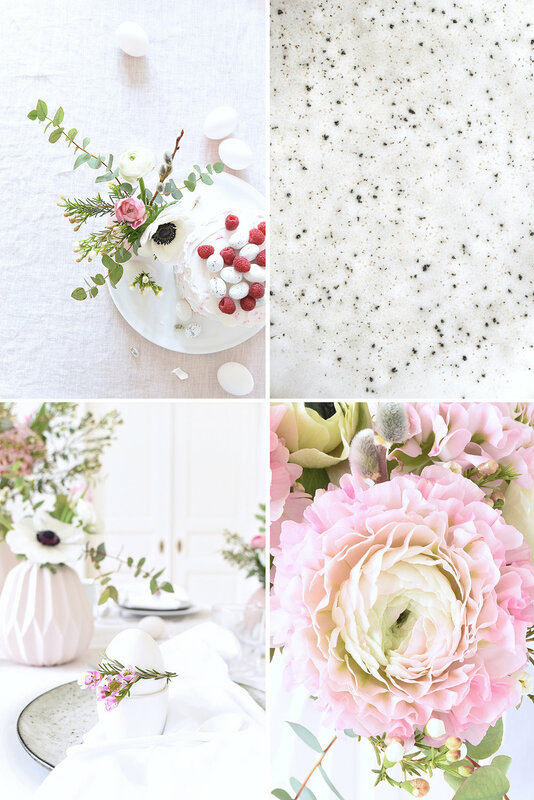 I have to agree, rose is such a serene color and perfect for the spring tabletop. Leave your stress and worry behind, sit down, relax and enjoy... In fact, I did not hesitate to use rose quartz in my Easter tabletop shown below. I hope that it inspires you to try a little rose quartz at home, too.